It’s not often that Lincoln, Nebraska is abuzz with basketball happenings. But that’s exactly what happened Monday night in Nebraska’s capital city. Pinnacle Bank Arena was bedlam after Tim Miles got his signature win for the program he’s attempting to build from the ground up. For the first time in six seasons, Ohio State’s lost four consecutive games. The Cornhuskers upended the Buckeyes 68-62 Monday night in front of a boisterous home crowd in brand-new Pinnacle Bank Arena. It was quite the turnaround for Nebraska, which lost by 31 points in Columbus on Jan. 4. 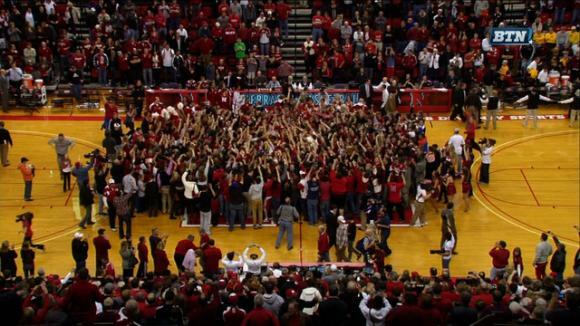 Sixteen days later, Miles was in the middle of a throng of court-storming fans. Eight Ohio State players scored, with Aaron Craft’s 12 points leading the way. LaQuinton Ross had 11 and Lenzelle Smith Jr. scored 10. Once again, the Buckeyes were vulnerable in the lane, where the Huskers scored 38 points. In the past three losses – Iowa, Minnesota and Nebraska – Ohio State’s surrendered 120 points in the paint. Aaron Craft’s turnover barrage also continued. He has 19 during the four-game skid. He and Scott have a combined 31 assists and 31 turnovers over the same four games. The second-largest crowd in the new arena’s history – 15,342 – saw the Huskers cruise to a 14-point first-half lead thanks to a 13-0 run. The 17th-ranked Buckeyes went six minutes without a single point and nearly seven minutes without a field goal. A purple-faced Thad Matta delivered a message that was received. Five quick points before halftime trimmed the deficit to single digits. An 18-2 run to begin the second half put Ohio State in front. Nebraska only scored nine points during a 15-minute stretch over the first and second halves. The Huskers regained their composure down the stretch, though, using a 16-5 spurt to take control and rebuild a double-digit advantage. They converted 13 of their last 16 free throws to keep the Buckeyes at bay. Ohio State shot 39.6 percent from the field and a horrendous 66.7 percent from the free throw line. The Buckeyes were also subpar from three-point range, finishing 6 of 21. Nebraska only made two shots from long range, but connected on 50 percent of its field goals. A 20-of-26 free throw performance dazzled. Ohio State falls to 15-4 overall and 2-4 in the Big Ten. The Buckeyes host Illinois on Thursday.